Okay, before you get huffy that rack of lamb is not a back-to-school dinner, let me tell you a story. My little one started high school this month. And the day before school he said, "I'd like to request some food since it's my first day of high school." Okay. He picked Off-to-High-School Crêpes for breakfast and rack of lamb for dinner. I had him rub the spices on the lamb before we all ran out the door for the day. He wanted a Middle Eastern-spiced lamb, so he added some harissa. And, when we got home, I stuck the lamb in the oven and took him to the store to get notebooks and other supplies for school. I told him that he needed to keep it under 45 minutes; we got home six minutes before the timer went off. I pulled the lamb out of the oven and let it rest while we chatted about his first day of school. Success! 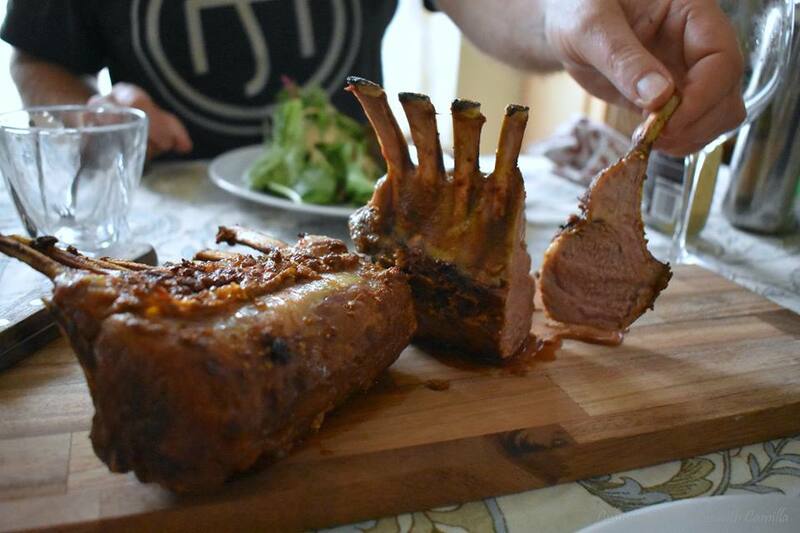 'Rack of Lamb' might sound fancy, but it's just like any other roast. Really. And it literally was our back-to-school dinner! I served it with a simple salad and finished off the evening with some Mini Peach Galettes for dessert. And if you have two hungry teenage boys in your house, be sure to double this and get two racks! Mix all of the spices - up to the cardamom - together with a splash of olive oil to create a thick paste. Rub the paste all over the lamb and refrigerate until ready to cook. Remove the lamb from the fridge at least 30 minutes before cooking. Place the lamb in a roasting dish, meat-side up, and drizzle liberally with olive oil. Roast, uncovered, for 45 minutes. Turn off the heat and let the rack stay in the oven for another 5 minutes. Remove pan from oven and let rest for another 10 minutes before slicing. I remember lamenting, for years, that my boys didn't care for lamb. Now I joke that I wish they didn't like lamb. My monthly meat budget would be a lot cheaper No, I am grateful for their adventurous palates and really happy that they like lamb because it's one of my favorites! haha Cam, only in a food bloggers family is rack of lamb a back to school recipe. I love that he got to pick his own first day of school meals. SO very true, right?! Yes, picking meals is a favorite task for them for special events or milestones. 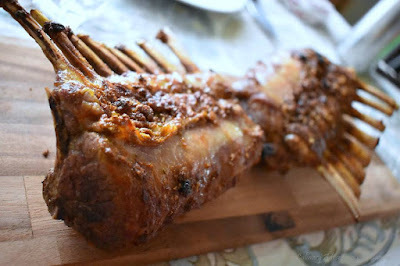 I had to smile when I saw rack of lamb in Wendy's list of back to school links. I thought, "Only Camilla!" What a sweet post. I'm sure he so appreciates having you for a mom. Thanks, Karen. Glad you stopped by.